From the time I was in 8th or 9th grade to the time I went to college, I thought being a dentist was my destiny. Dentistry, to me, was like creating sculpture in someone’s mouth and I loved to sculpt, or making models, and these skills would surely translate to my future profession. When I went to college, everything was great until sophomore year when a friend of mine, with whom I played baseball, hurt his back-while playing basketball – oddly enough. He eventually found his way to a chiropractor because nothing else was helping him, and the chiropractor fixed him. His problem resolved, without drugs or surgery and he was back playing baseball in no time. I remember him telling me that the chiropractor focused on structure and function. I researched the field and made the decision not to pursue a career in dentistry, but to become a chiropractor. Once I made the decision, I had to let my parents know what I was doing. When I told my parents that I had changed my career path, needless to say they were a little disappointed, because chiropractors didn’t have the greatest reputation as far as they were concerned. I remember my parents giving me a look of confusion and saying, “You’re going to be a WHAT?” As if I just told them that I was going into some shady profession. At the time, my father was very ill with lung cancer, and he was spending a lot of time in Mass General Hospital recovering from various surgeries. It wasn’t until my mother spoke with many of the nurses, and she heard the good things that they had to say about chiropractic that she accepted my career choice as a good one. I was born and raised Marblehead. After graduating with honors from Marblehead High School, I attended Clark University in Worcester where I was a pre-med student while playing intercollegiate baseball and hockey. I did my chiropractic training at Los Angeles College of Chiropractic and although it was difficult, loved every minute of it. My favorite classes were Anatomy and Palpation/Biomechanics. 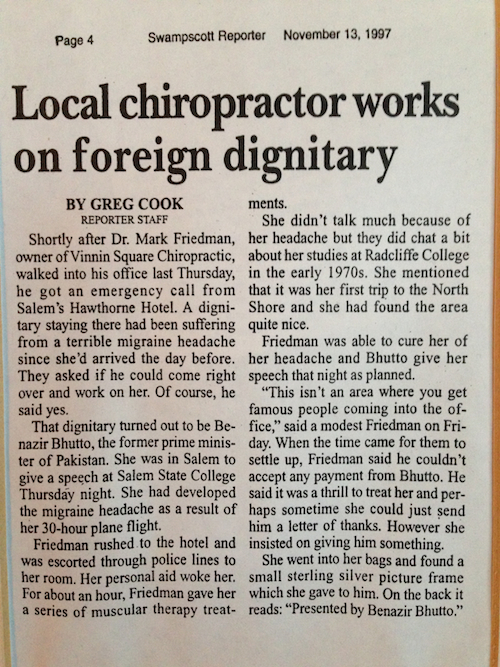 After receiving my Doctor of Chiropractic I went into private practice with a doctor in Saugus, Massachusetts, Michael Liberti, who taught me how to really care for patients. 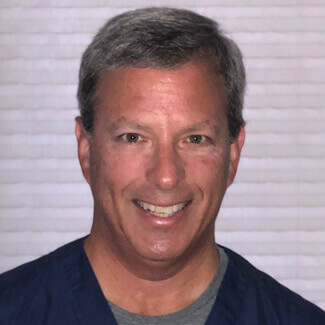 Dr. Liberti went through the Diplomate in Neurology program taught by Dr. Frederick Carrick and it completely changed his approach working with patients. I saw how chiropractic changed when looking at patients from a functional neurological perspective and decided that I needed to learn the same approach. From 1993 to 1995 I took the program through Logan College of Chiropractic; and then in August of 1995 sat the Diplomate examinations (a four day test), passed and was granted my Diplomate, which I maintain through continuing education every year. In addition I have taken a program in Functional Medicine which integrates with the Functional Neurology that I have been doing for years. Since 2005 I have been practicing Manipulation Under Anesthesia at the Pain and Wellness Center. My training and treatments make me unique among chiropractors in this area. Presently, I remain the only chiropractor actively performing Manipulation Under Anesthesia in Massachusetts. There’s a lot of satisfaction being a chiropractor knowing that when I treat a patient and they get better, it’s not because of a medication, it’s because I got to the root of the problem and directly helped their body change. I want patients to be comfortable with my practice. I will not “hard sell you. If you treat with us, you can rest assured that you will receive a treatment program designed to resolve your problem as fast as possible, with the most appropriate treatment. I have been a patient in other doctors’ offices. I understand the insecurity and concern that comes with having a health care problem. I not only tell you what is wrong and how it needs to be treated, but take into consideration the implications of the information I’m providing. What are the costs of treatment? How much of your time is it going to take? I have a wife, Patty, and 2 wonderful boys, Ethan and Pierce. We live locally and are involved in many community activities. 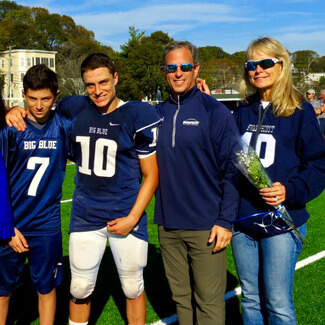 Ethan is now off to the Isenberg School of Management at the University of Massachusetts – Amherst, and Pierce has just started High School here in Swampscott. We are avid skiers and Patriots fans and love tailgating almost as much as skiing. I took up mountain biking 5 years ago and am completely addicted to the sport. I receive chiropractic treatment at least monthly, sometimes a little more often if I’ve been working out hard, or sometimes a little less if I’ve been busy (just trying to be honest). Patients often ask me if I use medication. I have no problem with the occasional use of over the counter medications, as long as they are not used regularly for pain control. If pain is frequent, seek treatment to resolve it,by whatever profession you choose, don’t just cover the problem. Well, that’s certainly enough about me. Thanks for visiting our site. Contact RightSPINE Chiropractic Neurology today to make an appointment.